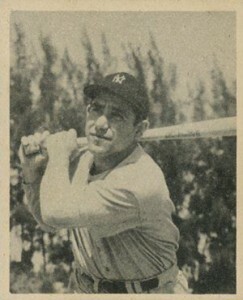 1948 Bowman Baseball marks the first time the company made a set of cards for the sport. The checklist might be small and the design plain, but it's a landmark release for numerous reasons including several key rookie cards. The set has just 48 cards, 12 of which are short prints. Top rookies in the set feature a trio of all-time greats: Stan Musial, Warren Spahn and Yogi Berra. Other rookies in 1948 include Red Schoendienst, Phil Rizzuto, Ralph Kiner and Bobby Thomson. Measuring 2 1/16" by 2 1/2", cards are smaller than today's standard size. Photos are very plain. Done in black and white, players are shown with largely boring waist-up shots that are tightly cropped and show little personality. There are a few exceptions but not many. Backs are similar to what collectors found on Goudey cards before World War II. 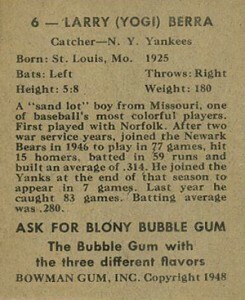 The top has the card number and player's name in a headline. Vitals follow along with a short bio. The bottom of the cards have an ad for Blony Bubble Gum. 1948 Bowman Baseball is an important set for the hobby. It introduced a major manufacturer that helped usher in modern trading cards. The cards aren't nearly as attractive as Bowman sets made a short time later but the set's significance is more as a launching point for the brand and the key players. 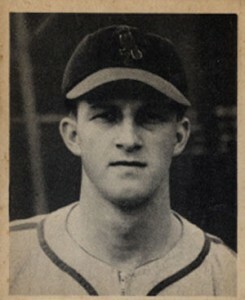 Although popular, cards don't generally sell as well as those from 1948-49 Leaf. Granted, that set has rookie cards of Jackie Robinson and Satchel Paige, something Bowman doesn't. The color in Leaf is also considered to be more pleasing by a lot of collectors. 1948 Bowman #35 George Stirnweiss Rookie !! Yankees LOOK !!!!! 1948 Bowman #32 Bill Rigney Giants LOOK !!!!! 1948 Bowman #27 Sid Gordon Giants LOOK !!!!! 1948 Bowman #25 Barney McCoskey Athletics LOOK !!!!! 1948 Bowman #21 Ferris Fain Rookie !! Athletics LOOK !!!!! 1948 Bowman #20 Buddy Kerr SP Giants LOOK !!!!! 1948 Bowman #15 Eddie Joost Athletics LOOK !!!!! 1948 Bowman #1 Bob Elliott Rookie !! Braves LOOK !!!!! 1948 Bowman #17 Enos Slaughter HOF Cardinals PSA 6 ! !